You’ve all heard of the movie Casablanca. Even if you didn’t see it in its entirety, most people know of the movie and the famous line spoken by the lead actor, Humphrey Bogart: “Here’s looking at you kid.” The fact is, the movie was not shot in Casablanca and until recently there was no Rick’s Café in Casablanca. Yet, this movie has helped to romanticize Morocco – specifically Casablanca to the rest of the world and I too fell for the hype. I took a 3 and ½ hour train ride from Marrakesh to Casablanca. The train wasn’t as nice as the trains in Europe or America, but it was fast, on-time, had a toilet, and they served snacks throughout the journey. The stops were not announced and the main stop for Casablanca is called Casa Voyageur and not Casablanca (for anyone traveling to Casablanca by train). Who knows where I would have ended up had a passenger seated across from me the entire journey didn’t tell me to disembark at Casa Voyageur. Once I came out on the other side of the station my first impression was “What a dump!” I negotiated my fare with the taxi driver and headed to my hotel. The ride from the train station to the hotel was relatively uninteresting and fairly run down. Many people asked me why I was going to Casablanca. The goal for my Moroccan trip was to see something old such as Marrakesh and Fez (although I didn’t visit Fez this trip) and to see something modern and akin to any major city in the world. Perhaps I should have read some more reviews about Casablanca and the other major cities, but by the time I was warned against going, it was too late to cancel. I was determined to make the best of my experience in Casablanca and see what the city had to offer. Just as in Marrakesh, I didn’t waste any time unpacking or getting settled in my hotel as I was to meet another CouchSurfer, “F”. He picked me up and we drove along the beautiful coast until we reached the Morocco Mall. The coast was perhaps the most interesting part of Casablanca and seemed really appealing on a hot summer night or any weekend. I arrived on Monday. The Morocco Mall is the largest shopping center in Africa according to “F” and Wikipedia. There is a small aquarium in the center, an IMAX and retail chains such as H&M, Gap, and McDonalds. After lunch in the mall, “F” drove me to what is no doubt the gem of Casablanca, The Hassan II Mosque. The mosque is the biggest in Morocco and seventh largest in the world. “F” and I talked about it and I have also asked other people about the mosque. They told me it was built during a huge economic crisis in the country and during a time where there was ambivalence toward the monarchy. The hope was that mosque would bring more support from the Muslim population for the monarchy. For many Moroccans, the mosque brings resentment as many believe the mosque was lavish spending in a time when the country could not support the expenditures. Afterwards, we walked around the Old Medina where I tried to determine if there was anything different I could buy in Casablanca that I couldn’t buy in Marrakesh. The answer was no. Whilst walking through the Old and New Medina, I noticed that Casablanca was a haven for knock-offs. The last time I have seen so many knock-offs, I was in a china-town in some city in America. And these were not the typical knock-offs of Luis Vuitton purses. There were also knock-off Converse and Nike trainers. 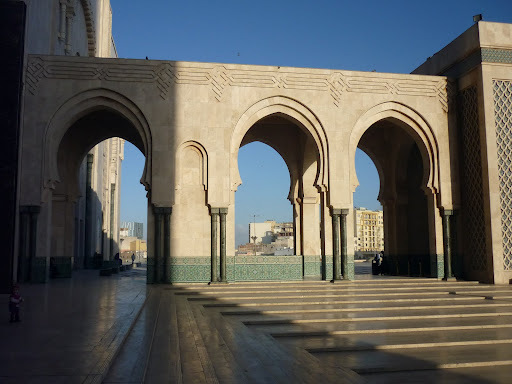 Casablanca lacked the old world charm of Marrakesh and met my expectation of a modern, westernized city. I ended the day with some lovely tea at Café Maure which I highly recommend on any future visits to Casablanca. I was told by many that there was really not much to do in Casablanca – which is why I choose to name it a trip to Casa-blah. I asked the hotel staff if there were museums or galleries I could visit and they said no. For tourists, Casablanca only offered the beach, mall, and few interesting buildings which I didn’t get to see. They also offered some of the markets similar to that in Marrakesh, but on a much smaller scale. The next day, I returned to the market I visited the night before on foot and after picking up a few small items I headed by taxi to another large market that was suggested to me. I negotiated the price with the taxi driver beforehand and drove a short distance to the other side of town. The traffic made the journey longer than necessary, but during the drive we talked in Arabic and French until we reached the market. I thought our exchange during the drive was pleasant, but then things turned ugly. He demanded 100dhm from me instead of the 20dhm that we had agreed on. He then indicated that he meant dollars and not dhm. However, I told him why would I travel with dollars in Africa. We argued back and forth until finally I threw 50dhm at him, got out the car, and slammed the door shut. I only paid 20dhm from the train station to my hotel which was an equal if not further distance. After sharing my experience with a few people, they indicated that I should have written the name of his car down and reported it to police AND I should have also told him I was going to do so. This experience made me bitter and angry. I was no longer interested in seeing anything else in Casablanca – at least not on my own. I literally walked around less than 10 minutes and walked back to my hotel. Extremely hungry I asked my hotel if it was alright for me to have a meal at the pizzeria across the street. I asked because I didn’t see any women at the cafe. Having been rejected once at a cafe, I wanted to make sure it was alright before I was embarrassed again. Once inside I ordered a “Panini avec frommage…no tomato…no sousage…frommage only” (Panini with cheese only). The waiter said ok. A few minutes later he came back with a Panini with mayonnaise, unmelted cheese, tomatoes, and some salad on the bread. I told him this is not what I asked for. He said I could choose something else. However, I didn’t want to choose anything else, I just wanted bread and melted cheese i.e. a cheese panini. Once I realized that I was not getting my point across, I prepared to pay for the meal in entirety. He handed me my bill which only included the fritz and cola. When I went to pay he told me he didn’t have any change for the 100dhm I gave him despite the fact that the restaurant was crowded. Furthermore, he made no effort to indicate he was going to get change. I waited and waited and waited. Finally I went up to the cash register where what appeared to be the ‘manager’ and stood and waited for him to give me change. I then asked him why I couldn’t have cheese only. He told me “if you want cheese, go to McDonalds” and pointed to where the McDonald’s was. Needless to say, I was infuriated, took my change and went back to the hotel hungry and infuriated. With so much frustrating building inside of me, I was very much looking forward to the spa treatment I booked earlier in the morning. I had only visited a spa once in my life and that only included a back massage and a facial. I didn’t know what to expect. All I can say it was a very relaxing and a pseudo lesbian experience that lasted for almost three hours. I fell asleep a few times and I felt extremely relaxed. In Morocco the spa services are called Hammam’s which is another word for bathroom. I highly recommend that if you visit, book a trip to a Hammam! After my hammam sevice, I really just wanted to go to sleep for the night, but I needed to meet another CouchSurfer, “S”. “S” and I walked around the New Medina, we ate some ktban (kebab), met up with some of his friends for tea and shisha, and watched Arsenal beat AC Milan (but ultimately Arsenal was eliminated from the Champions League). One of the things “S” and I talked about was my frustration earlier in the day. He indicated that I was treated that way because people probably thought I was African. A few times he interchanged African with Black. I could tell he was trying not to offend me, but I was baffled by this statement. Morocco is in Africa. Therefore, Moroccans are African. However, just like in any country, there are dividing lines be it class, race, religion, etc. In the case of Northern Africa, those of Arab descent clearly want to be differentiated from the rest of Africa. This is not the first time I have heard about this attitude from Northern Africans. However, I have never had anyone articulate that statement personally to me. He, like many North Africans, don’t see themselves as African at all. They are Egyptian or Moroccan only. I have many friends from various parts of Africa (excluding the MENA region). Even if they are living in France, America, or in Africa, they always consider themselves very much African no matter if their state is Nigeria, Ghana, or Guinea. “S” also suggested that I really didn’t get to see Morocco and that I needed to stay longer and see more things. I started thinking…really thinking and when I went back to my hotel, I decided that in fact I wasn’t ready to go back to Spain nor to Italy as planned. I discussed my thoughts with JB and he decided to come along with me to Essaouira and he also suggested that we go to Oaurzazate (the oasis or entrance to the desert). After departing the train, I quickly checked into my hotel which was located in the Gueliz section of Marrakesh. Marrakesh is the perfect dichotomy of old and new. In one part of the city you have the old medina and the markets where I stayed the first few days. Gueliz, on the other hand, is the modern part of the town. There are a few McDonald’s, a Kentucky Fried Chicken, Zara, and other European and American chain stores. Night clubs and restaurant’s serving alcohol line the main and side streets. After checking into my hotel, JB and I headed to the Jardin el Harti. On the way, we stopped at a local chop shop for lunch. I thought I was a germ-a-phone before arriving to Morocco, but I have realized that I have more tolerance than I thought. If you are concerned with cleanliness or catching salmonella, then Morocco is not the place for you. There were too many cleanliness battles to fight so instead of fighting them, I just looked the other way. 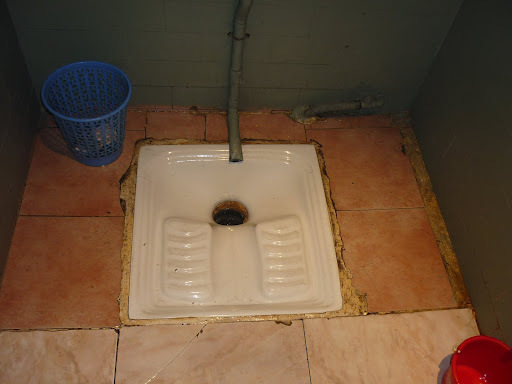 In addition to the lack of cleanliness in the eating areas, the bathrooms proved to be even more of a challenge since most places did not use English toilets. The toilet. I still don’t understand how you do #2 in this. After eating our lunch, we walked around the garden taking pictures of the various couples around the park. 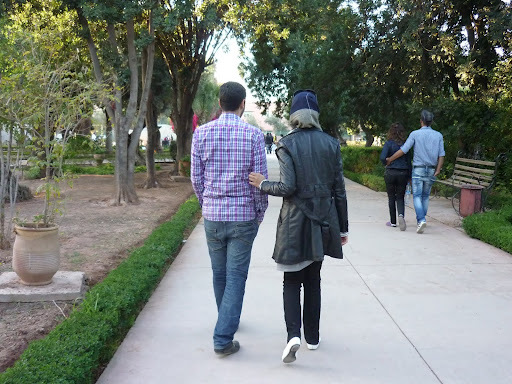 For the most part, I didn’t see any couples showing public display of affection of any kind in Marrakech. This was a point, I noted to my hosts JB and “F”, but they told me it was around. It wasn’t until I was in the Jardin that I noticed all the public displays of affection. We tried to determine if the people were husband and wife or simply boyfriend and girlfriend. Additionally, I made it my mission that day to capture as many couples as possible on camera. After the sun set, we headed back to the Djemma El Fna where we met up with another couch surfer, “J”. “J” is currently in France doing an exchange. 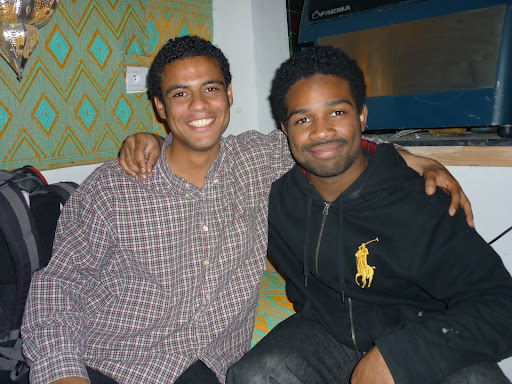 He is originally from Atlanta and studying in Boston. After some tea and more food at Bakshish we headed to JB’s friends house. There, we listened to music and drank a bottle of wine that “J” carried from France. I also met another couch surfer “A” from France, who was staying at JB’s friends house. It was a CouchSurfing extravaganza and a lovely time. I was quite tired and after some time, I bid everyone goodnight and grabbed a cab back to my hotel to prepare for my early start the next day to Essaouria.